Jacqueline Fairbrass stands by the sign to her new office at 231 Bendigo Boulevard N, North Bend. Courtesy photo. Jacqueline Fairbrass has been helping Valley residents through wellness and life coaching for the past six years. 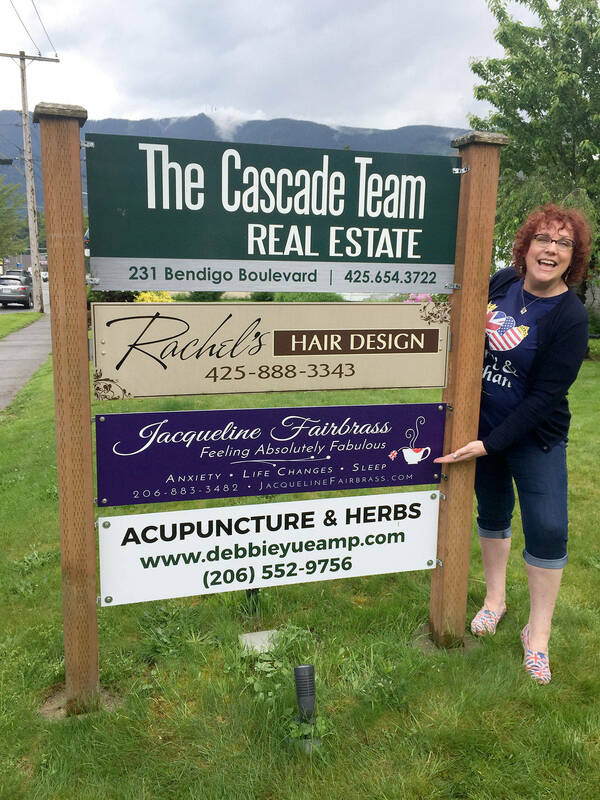 Fairbrass recently moved her business into a office in North Bend to provide a better experience for her customers. As a licensed hypnotherapist and life coach, Fairbrass has been working in complementary and alternative health care for more than 25 years. Through her business, Feeling Absolutely Fabulous, she offers consulting services and focuses on nutrition, yoga, reflexology, aromatherapy, reiki and more. She said that people have come to her for help working through grief, building self-confidence, learning to study more efficiently, and with fears or phobias. Hypnotherapy, she said, is similar to the light trance state of daydreaming. By helping the people she works with into a more relaxed state she can then begin to help them work through whatever they came to her for. Fairbrass began taking classes in complementary and alternative health at home in the United Kingdom before moving to Ottawa, Canada where she continued her work. In Ottawa she became a licensed naturopath and was on the board of directors for the Anxiety Disorders Association of Ontario for six years and was president for two. In 2010, Fairbrass moved to the Snoqualmie Valley and began running her health and wellness business out of her home, over the phone, and online. In May she moved her business into a separate building in North Bend in order to create a space more well suited to relax her customers. While she now has the office, Fairbrass also continues to teach healing modality online to students from around the world, she said. Fairbrass is also the current president of the Snoqualmie Valley Women in Business group. She said the group was an important resources of support and friendship when she first moved to the Valley and she is happy with the way the group has developed in the following years. Fairbrass became the vice president of the group in 2014 and is in her third and final year serving as president. In addition to focusing on business and networking, the group also focuses on the community aspect of the area and building relationships between members. “Our tagline is building business through building relationships,” Fairbrass said. She was also on the board of the Snoqualmie Valley Chamber of Commerce from 2015 to 2017, which was another way she got introduced to the Valley community. Fairbrass encourages anyone interested to join the Women in Business for their monthly luncheons at the Snoqualmie Casino where they feature speakers on topics around growing business and networking. As for her own business, she is now located at 231 Bendigo Boulevard N., North Bend; for more information, visit jacqueline fairbrass.com.